« Elections Office will update 2014 Statewide Primary results at 4 p.m.
On Father’s Day, Sunday, June 15, 2014, San Bernardino County Museum Curator of Paleontology Eric Scott will discuss Ice Age fossils from urban southern California. The 2 p.m. presentation at the County Museum in Redlands is included with paid museum admission. During the Pleistocene Epoch—the “Ice Ages”— Southern California summers were cooler and year-round temperatures were more moderate. Snow and ice were present for most of the year in local mountains. “We had streams and lake in the valleys, fed by mountain ice, which provided lots of sustenance for plants and animals in the valleys. The evidence of these ancient organisms lies right beneath your feet,” said Scott. 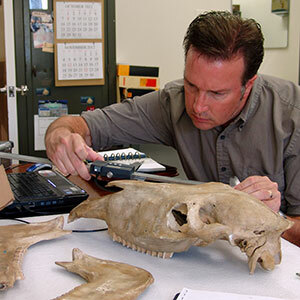 In his lecture, Scott will talk about Pleistocene fossils from throughout southern California, with special emphasis on the Rancho La Brea “tar pits” in Los Angeles. He will also examine more local sites such as Diamond Valley Lake in Hemet, California, where County Museum paleontologists working from 1993 through early 2000 excavated one of the richest non-asphaltic Ice Age sites anywhere in the American southwest. The San Bernardino County Museum is at the California Street exit from Interstate 10 in Redlands. The museum is open Tuesdays through Sundays from 9 am to 5pm. General admission is $10 (adult), $8 (military or senior), $7 (student), and $5 (child aged 5 to 12). Children under five and Museum Association members are admitted free. Parking is free. For more information, visit www.sbcountymuseum.org. The museum is accessible to persons with disabilities. If assistive listening devices or other auxiliary aids are needed in order to participate in museum exhibits or programs, requests should be made through Museum Visitor Services at least three business days prior to your visit. Visitor Services’ telephone number is 909-307-2669.